Customer users act on behalf of the company and may have a limited set of permissions in OroCommerce, depending on their function in the customer organization. 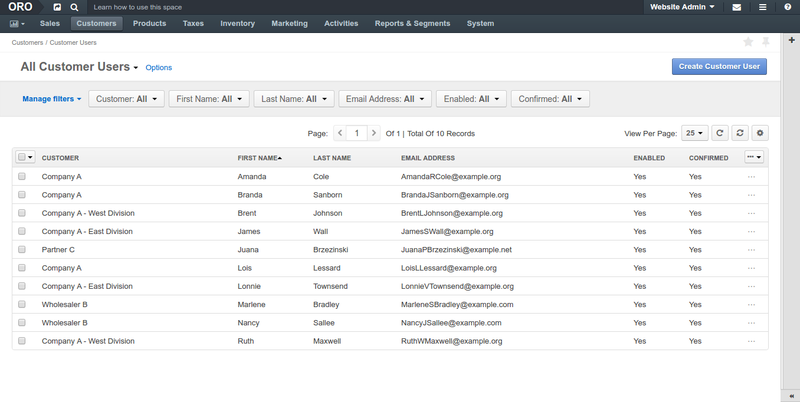 For customer user management, navigate to Customers > Customer Users in the main menu. View, edit, and create new customer users. Select their roles in OroCommerce to define their level of permissions and access to the actions and data in OroCommerce storefront. 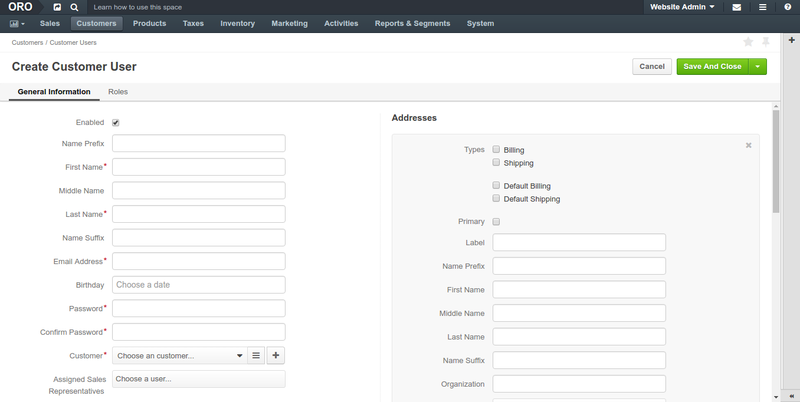 View requests for quotes, sales orders, quotes created or submitted by the customer user. View communication with the customer that happened using email, notes or scheduled events. View additional information attached to customer user. Enable and disable the customer. Reset the customer user password. You can delegate this function to the customer who will access user and role management in the OroCommerce storefront (see Delegating Users and Role Management to the Customer section for more information). Upon registration, a customer user receives an email confirmation request. Once they follow up with the requested action, their account is marked as confirmed. Navigate to Customers > Customer Users in the main menu. Select the Enabled check box to enable the user to log into the system and to do their work within it upon creation. Fill in customer Name and other personal information. Select a customer this user represents. If you are adding a subsidiary of the existing customer, select a parent customer. Assign a sales representative who will be assisting this customer user. By default, the customer sales representative applies to the customer user. Select the Generate Password and Send Welcome Email check boxes. Select the website the customer user will be redirected to upon the login. See Managing Websites for more information. Select a Preferred Localization for the customer user. This field is displayed if more than one localization is enabled for any of the websites of the current organization. If you change the website for the customer user, you will need to select a new preferred localization. Add billing and shipping address as described in :ref: the Address Book section <user-guide–getting-started–address-book> . In the Roles section, select the roles that should apply to the customer user. When several roles are selected, granted permissions are accumulated from all the assigned roles. See Managing Customer User Roles for more information. At least one role must be assigned if the Enabled check box is selected. Disabled customer users can be saved without roles, but you will need to assign roles to the them later before enabling. The new customer user is created. When at least one consent to process personal data has been accepted by a customer user in the storefront, you can view this information in the dedicated Consents section on the page of a particular customer user under Customers > Customer Users. You can import the bulk details of updated or processed customer user information in the .csv format following the steps described in the Importing Customer Users guide.